Background: This species occurs only in the Pacific Northwest from British Columbia on the west side of the Cascades and in the Coast ranges to coastal northern California. It is a large salamander that spends the majority of its life underground in rodent burrows and under logs. Northwestern Salamanders are most often observed crossing trails and roads (sometimes with fatal consequences) in the early spring and after the first rains in the fall as they move to and from aquatic breeding sites. This species is noted for frequent occurrence of paedomorphosis (i.e., retention of larval characteristics in the adult form). Paedomorphic adult Northwestern Salamanders are gilled and remain aquatic throughout their lives. Like most salamanders, Northwestern Salamanders possess poison glands in their skins, including the large parotoid glands on the head and glands along the tail, as an (imperfect) anti-predatory defense. To express the poison, the salamander will push its back up and snout down (like a bucking horse) after which a white ooze seeps out and covers the back of the salamander. Do not ingest or touch your eyes with this goo! Adult and Juvenile Description: The adults of the species can be large, sometimes exceeding 8 inches (20 cm) total length. They are generally uniformly dark brown, except for the poison glands which are lighter colored. Costal grooves (vertical grooves on the sides of the body between the intercostal folds, the tissues over each rib) are pronounced. The head is relatively large, with a rounded snout, and the tail is long and somewhat paddle-like. Larval Description: Larvae are gilled. The feathery gills resemble ostrich plumes held to the sides of the body. Compared to Long-toed Salamanders, the head is only slightly wider than the body at hatching. With age and development, the head becomes larger, with a broad snout. Larvae are olive brown to dark brown, with dark mottling or well-defined spots on the back and fins. Because Northwestern Salamander larvae typically do not metamorphose until their second summer, two size classes of larvae may be present at a site for much of the year, representing first and second year larvae. Larvae undergoing metamorphosis will have reduced gills and more muscular legs. In contrast, individuals destined to be paedomorphic have the appearance of unusually large larvae. 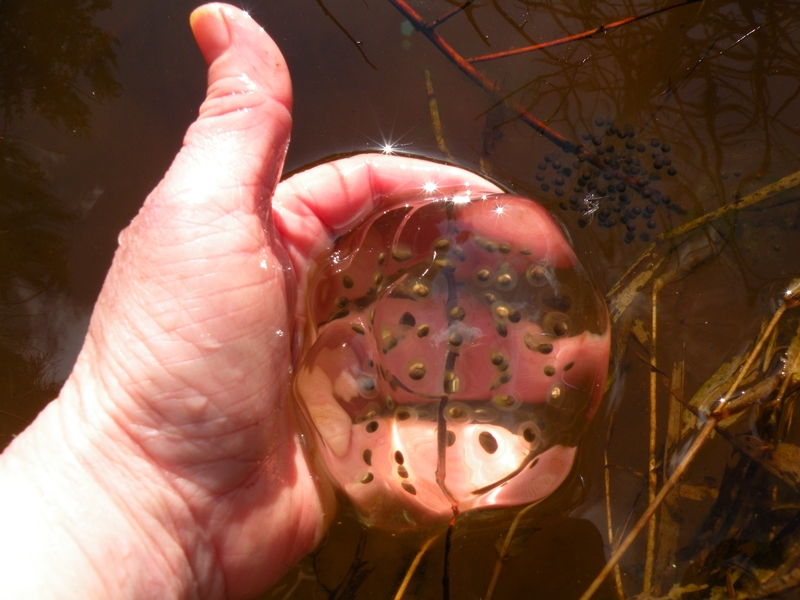 Egg Mass Description: The egg masses of this species are deposited in late winter or early spring (earlier or later depending on elevation), are conspicuous, and persist for a remarkably long time, even after the embryos have hatched. These firm balls of jelly range in size from a small orange to a small grapefruit, with a smooth or slightly wavy surface. Masses are usually firmly attached to a ‘brace’ (e.g., a stem or twig) and may be near the surface or in water more than 3 feet deep. Freshly laid masses are distinguished by the bicolor appearance of each egg and crystal clear jelly. The egg capsules of older masses may exhibit the green color of symbiotic algae. Embryonic development is slow, often more than a month, particularly within masses in deep, cold water. Habitat: Found sea level to about 6500 feet in elevation, Northwestern Salamanders flourish in cool, moist, coniferous and deciduous forests with abundant downed wood and stumps and proximity (i.e. within about 0.5 mile) of permanent to semi-permanent bodies of water, including ponds, small lakes, and slow moving streams/sloughs, which provide breeding habitats. However, it is not unusual to find a few egg masses is small, spring-fed pools and seasonal sites, where larvae will likely not survive. At high elevations, entire populations may be paedomorphic. Northwestern Salamanders are able to successfully coexist with fish. Locations in Whatcom County: This species is widely distributed in Whatcom County and can be expected in or near most permanent ponds, slow moving streams, and permanent ditches. Northwestern Salamander is evidently a secure species and has no State or Federal listing anywhere within its range.